Hours: 8am - 4pm, Monday through Thursday. While most inquiries will be answered within 24 hours, please allow up to 72 hours not including weekends and holidays. 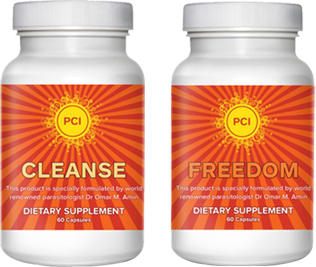 Buy a 60 count bottle of Freedom, and receive a 60 count bottle of Cleanse FREE. Garlic, Olive Leaf Extract, Citrus Seed Extract, Goldenseal, Aloe Vera, Pomegranite, Oregano Leaf, CloveFlower, Black Walnut Husk, Peppermint Leaf, Black Cumin Seed, Winter Melon Seed, Gentian Root, Wormwood Bark, Hyssop Leaf, Cramp Bark, Thyme Leaf, Fennel Seed, Pumpkin Seed, Caprylic Acid, Rosemary, Papaya, and Rangoon Creeper. Psyllium Seed Husk, Atlantic Kelp, Corn Silk, Fo-Ti, Chinese Rhubarb, Peppermint Leaf, Black Cumin Seed, Cinnamon Bark, Fennel Seed, Ginger Root, Orange PeelExtract, Clove Bulb, Cascara, and Slippery Elm Bark. Molasses, Carob, Rhubarb Root, Sage, Thyme Leaf, Ginger Root, Clove Bulb, Cayenne Fruit, Rosemary Leaf, Alfalfa Oil, Licorice Root, Chamomile, Grapefruit Seed Extract, Echinacea, Atlantic Kelp, Chicory, Corn Silk, Fennel Seed, Peppermint Leaf, Safflower Oil Powder.